This tapestry "William Morris Woodpecker III" shows a work based on the famous design by Morris from 1877 and is unique in that this work was designed in its entirety by Morris. We see the hallmark features of the work from Morris with the intricate details of the acanthus leaves in red in this version of the work. The legend has it that the Italian King Picus was transformed into a woodpecker by Circe. The poem reads "I once a king and chief, now am the tree-barks thief, ever twixt trunk and leaf, chasing the prey". In this piece we see the woodpecker in the branches of a tree laden with ripe fruit, and the elements of leaves, fruit, and an elaborate border as well as the famous acanthus leaves known for its large beautiful leaves can be seen to great effect in this work. This design shows the acanthus leaves in beautiful reds. 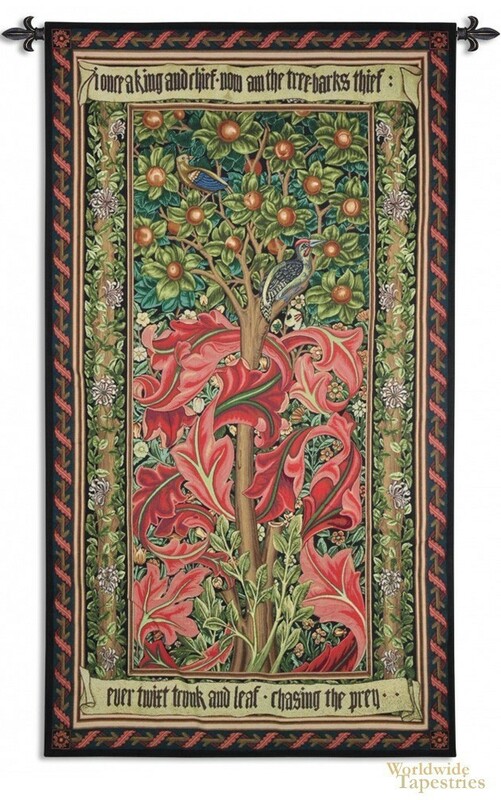 This tapestry "William Morris Woodpecker III" is backed with a tunnel for easy hanging. Note: tapestry rod and tassels, where pictured, are purchased separately.